Over a century old, Hajduk have experienced... everything, from winning nine titles in less than ten years and being the football “boss” not just of Croatia but of whole former Yugoslavia back in the seventies, to spending more than a decade lifting zero trophies, not to mention that much more recently they came too close to going bankrupt. No matter what, they have been ever since they were founded more than 100 years later a source of pride for Split's football fans and community in general. Hajduk's Poljud Stadium, home of the team since 1979. Hrvatski Nogometni Klub (Croatian Football Club) Hajduk Split were founded in 1911, interestingly, not in Split, not even somewhere else in Croatia, but in a Prague tavern, in Czechia, by a group of students, originally from Dalmatia, and Split in particular. “Hajduk” was how an outlaw was called in the Ottoman Empire, especially in the Balkans, a thief, a bandit, but also a freedom fighter, and someone who tried to protect Christians when being treated unfairly by the Ottoman authorities. The team won their first national titles in “Kingdom of Yugoslavia” times, before World War II. In their official website the club include in the tally of the titles they have won not only those two, but three as well that they won during and right after World War II. Nevertheless, in former “SFR (Socialist Federal Republic) Yugoslavia”, they won the championship seven times, with the seventies by far their most successful decade. From 1971 to 1979 they won the Yugoslav First League four times, adding five Yugoslav Cups to their collection as well, lifting all those five trophies in back to back seasons! The club have remained in Croatia's elite after the dissolution of former Yugoslavia, winning the Croatian First League (1. HNL) title five times, but none since 2005, with Dinamo Zagreb ruling Croatia's football scene after that. That wasn't their biggest problem either; just before and right after celebrating their 100th birthday, the club came very close to going bankrupt, and it would have, beyond any doubt, if it weren't for the love and dedication of simple fans, who made sure to involve the municipality in their struggle to save Split's iconic club. Internationally, Hajduk have managed to reach the European Cup/Champions League quarterfinals three times, more recently in 1995. They have done even better in the now defunct Cup Winners' Cup and UEFA Cup, going all the way to the semifinals in 1973 and 1984 respectively. In 1973 it was Leeds United who put an end to their European dream, while in 1984 Hajduk fell to another English team, Tottenham, beating them 2-1 in Croatia, losing 1-0 in London, and being left out due to the away goals rule. What is rather little known about Hajduk is that right after the end of World War II, Josip Broz, most commonly known as “Tito”, the man who is considered to be the architect of the creation of SFR Yugoslavia, said to be a big Hajduk fan, offered the team the chance to move to Belgrade, the capital city of the country, and be the team of the People's Army, an invitation/offer the Croatian side rejected. Subsequently, Partizan Belgrade were founded. Hajduk are still not free of trouble. They still rely, heavily, on their own fans to finance the club, they are proud to have thousands of members practically worldwide, and a visit to their official website would show you how easy they make it to join the club as a member, paying a minimal amount per year. Plus, they have always been impressive in producing young talents. Players like Darijo Srna, Slaven Bilić, Alen Bokšić, and countless, countless others, have started their professional career in Split, before moving abroad, and getting associated in football fans' mind with Shakhtar Donetsk, for example, as it happens in Srna's case. Vedran Rožić, a Croatian defender during his playing days, before serving the club as a president as well, has worn Hajduk's jersey in more official games than any other player, 390, from 1972 to 1984, being a member of the glorious team that won everything in former Yugoslavia in the seventies. Frane Matošić, an iconic figure of the thirties, the forties, up until the mid fifties, has actually played in more than 700 games, but hundreds of those were not official. Hajduk used to travel a lot, going on long tours, even far away from Europe. Matošić is regarded though as the club's leading goalscorer, having 211 goals in official matches to his name. Hajduk's modern era logo (in use since 1990) is very-very similar to the one that Vjekoslav Ivanišević, one of the club's founders, is said to have designed right after choosing a name for the new team. 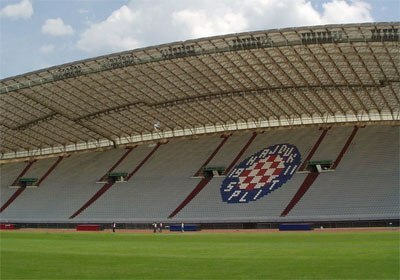 It consists of the well-known red and white Croatian checkerboard, with the words HAJDUK and SPLIT up and down, in a blue circle. A red star was included in the very center of the logo from 1944 to 1990. What's interesting is that more than 100 years after the club were born, it's still not 100% clear what the four vertical white lines stand four, with various conflicting explanations appearing here and there. According to one, it's two 11s, with 1911 being the year the club were founded.